Although the remote controlled Stanley F-16 Demolition 'robot' is not a robot in the strictest sense (i.e. autonomous) I thought it was worth mentioning. I love building stuff. But in construction work often you have to destroy something before building something new (most people call this 'the fun part'). I can think of no better way to wreak destructive havoc than with a robot on treads acting as an extension of my will. Mooah Ha Ha! Don't take it from me, read the article for better links and the horses mouth type stuff. Essentially though, scientists (the proverbial "they") think perhaps that MAYBE Europa could have been a rogue planet that got flung out of some other solar system and snatched up by Jupiter. Hey, it could be a planet considering all the elements for life which might exist (cross your fingers) on this [for now] moon. But on the other hand, why do we automatically "promote" a moon just because it has some of the elements necessary for life? Something to think about anyway. 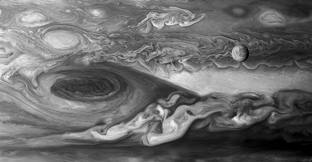 Also, by way of an update and to give special props to Europa, here's an article to follow up the "where in the universe is Jupiter's belt" mystery that was a news story (for us nerds) last year. Apparently, to quote the article, "Europa became the "guide star" for the adaptive optics to sense atmospheric distortions." Way to go Europa! I will be skiing this weekend so look for pictures on Twitter @authorjas! Why Should I Read Europa? Europa is an epic adventure story that contains: action, suspense, betrayal, love, gunfighting, rebellion, tragedy, hope, chases, submarine battle, space battle, strange creatures, murder and mystery. Europa was written to be a book I would want to read. I am quick to admit that I am not an exceptionally fast reader and used to be a very slow one. I have read a lot of different kinds of books and realize that for many people, myself included, investing ones time in reading a book is a serious commitment. I wrote Europa to be as original as possible. I do not like wasting my time on a boring book or one that, if it is exciting, becomes too obscene for me to continue to enjoy reading. Realism can be achieved without the use of vulgar additives. Jack London, Louis L'Amour, Dickens, Blackmore, Lewis and Tolkien accomplished this beautifully. It seems sometimes that there is not a story that has not 'already been done' and I made every effort possible to make Europa different. Marketing types always ask what my intended target audience was when I wrote Europa. I did not even know there was such a thing when I wrote it. I know it's cliche', and it is breaking a cardinal rule of marketing, but my answer is still an emphatic "everyone!" Yes. I am nearly finished with book two and already looking forward to starting number three. Not sure if you want to take the plunge into Science Fiction? Try reading Europa. People who are apprehensive about science fiction need not worry that the content is too 'out there' and difficult to understand or will degrade into a second rate tale of horror set in space. The technology in Europa is explained so that even people who have never read a science fiction novel can understand, but it is detailed enough that veteran geeks, like myself, can enjoy it. I don't think I do this often enough but here's some linkspam about Europa, not the book, the moon. Sky and Telescope did another story regarding Europa's visibility at the end of last month. I also did a blog post on January 23rd which explained the time you could actually see Europa, if you owned a telescope. This website goes into more detail about what you could have seen. I think this picture is awesome. It shows Europa in what they call the Gibbous phase. You can see a lot of detail in the picture; more than most pictures of this moon. And finally, a really cool news story about an Antarctic lake which mimics the conditions scientists believe exist on Europa. Practice, practice, practice! That's all for now. Enjoy your weekend! I really had so much fun at this Wizard World ComiCon. I didn't have high expectations because this is the first year that Wizard World held a con there. The traffic was good and I enjoyed meeting a lot of people. My next door neighbor at the con, John Holland, did a review on his blog too, so check it out if you get the chance. Also, I really enjoyed meeting Stefanie and Corey (just to name a few). I didn't get any pictures but Keisha Tillis was nice enough to stop by (she's in a show called "The Walking Dead"on AMC). And now for the good stuff ... the pictures! This Navi girl's paint job was authentic. Must have taken HOURS. Definitely my favorite costume (from Mass Effect). This costume was authentic and the guy could move easily in it. I hope he won a prize because it was AWESOME. Thanks to everyone who bought books and asked questions. Please shoot me an email anytime if you have any questions. In the meantime, just visit this blog for frequent-ish updates.